• Trade Tensions Continue to Ease. U.S. stocks extended gains into a fourth straight week, its longest winning streak since August, supported by positive economic data and signs the U.S. and China are nearing a trade deal. Gains culminated following a Bloomberg News report that China may offer a path to eliminate its trade surplus with America by 2024. Over six years, the move would have a combined value of $1 trillion in additional U.S. exports to China. • Weekly Performance. For the week, the S&P 500 gained 2.90%, the Dow Industrials rose 2.96% and the tech-heavy Nasdaq Composite advanced 2.67%. It was the first week since December that all three indices returned more than 2.5%. • Manufacturing Improves. The Federal Reserve reported Friday that manufacturing output was surprisingly strong in December, rising 1.1% versus forecasts for 0.3%. That’s the largest increase in 10-months and indicates U.S. manufacturing remains on solid ground. • Financials Perform Best. Ten of the 11 major sector groups posted gains last week, led by Financials (+6.14%), Industrials (+3.34%) and Energy (+2.91%). Utilities (-0.18%) lagged, while Consumer Staples (+1.64%) and Communication Services (+1.83%) rose the least. • Treasurys Trend Lower. U.S. Treasury prices declined all five days last week, sending the yield on benchmark 10-year notes up nearly 8.3 basis points to end at 2.785%. The U.S. Dollar Index strengthened for a fourth day on Friday, ending the week up 0.70%, while U.S. oil futures gained 4.28% last week, ending at $53.80/barrel. Friday, January 25: Durable and Capital Goods Orders, New Home Sales. The Federal Reserve hiked interest rates four times in 2018, bringing the target Fed Funds rate to a range of 2.25% -2.50%. The path to interest rate normalization accelerated last year, after only one rate hike in each of 2015 and 2016, and three rate hikes in 2017. We will likely see the Fed slow down significantly this year. 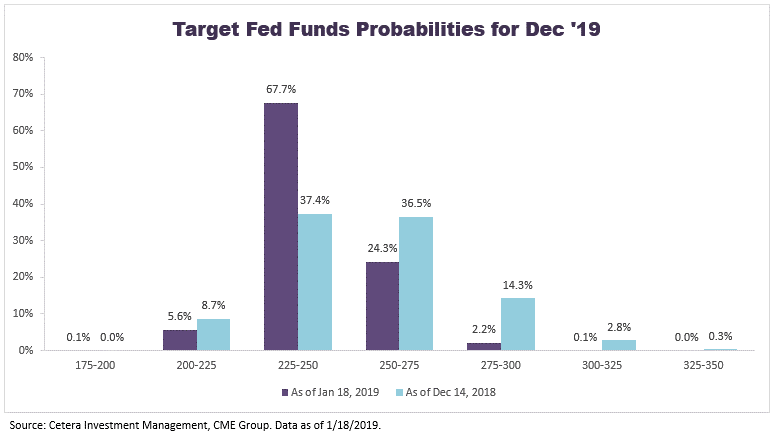 As of Friday, January 18, the probability that rates stay the same in 2019 is 67% and there is still a chance that short rates may fall in 2019. Economic data may support a more dovish position, after factoring in rising market volatility, a 2019 backdrop that will likely see slower economic growth, and more muted inflationary risks.